These are some sour cream containers that I made for the BBTB2 challenge. 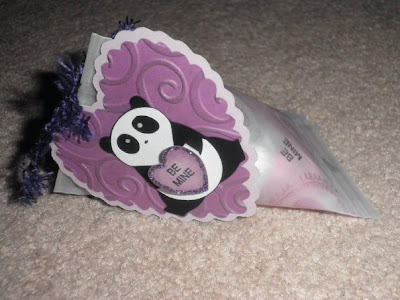 It was to make a Valentine's Day project and you have to use the color purple. 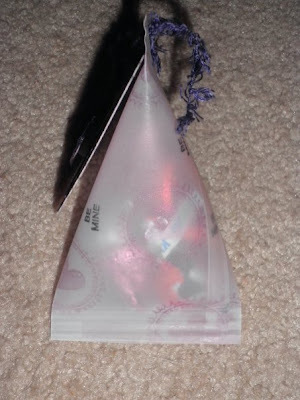 They are filled with hershey kisses. The panda is from Pagoda cartridge, the scallop heart and the small heart is from Sweethearts cartridge. 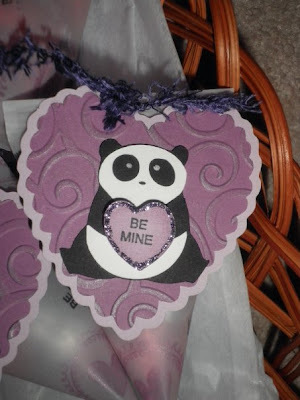 I stamped the vellum with a light purple heart and circle stamp and then in black "be mine". I also stamped the front of the little heart with the "be mine" stamp. 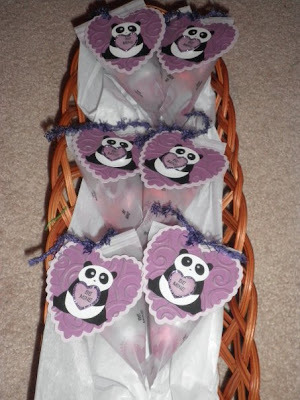 I then stickled the little heart with purple stickles. Side shot of the vellum. I just love your sour cream containers from vellum. I would never have thought to use vellum. What a great idea. That panda is adorable. Good luck. Very nice! I love the whole look. Cute little pressies. what cute little sour cream containers in all their purple glory. Thanks for playing along with our BBTB2 challenge. Oh, yum! and CUTE! These are darling. You're making me think twice about that Pagoda cart.